"I will speak words of blessings to others and refuse to speak or hear anything negative about another person unless they are present to defend themselves." 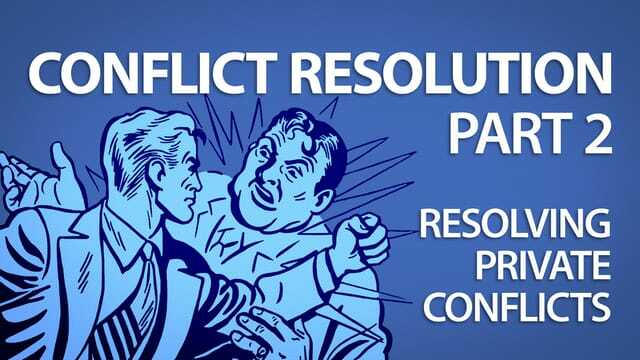 The 3-legged stool of conflict resolution. 1. REACTING when we've been hurt. 2. RESPONDING when we've caused hurt. If we INFLATE the conflict... it reduces the chances of a good outcome. If we SHARE the conflict... it reduces the chances of a good outcome. If we ANALYZE the conflict... it increases the chances of a good outcome. How do we decide whether to dismiss it or address it? "When a little thing pushes your buttons, it says something BIG about the buttons inside you." Step 1: Go prayerfully, humbly and alone. Step 2: Go with a neutral, 3rd party. Step 3: Go with all to the church. "God loves to forgive even more than you love to sin." Reacting when we've been hurt involves either dismissing or addressing it. There is no third option!